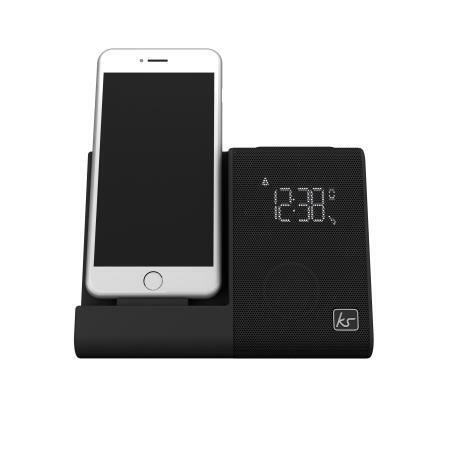 The X-Dock 4 is made specifically for devices with a Lightning connection including the iPhone 8 / 8 Plus / 7 / 7 Plus and other recent iPhones. 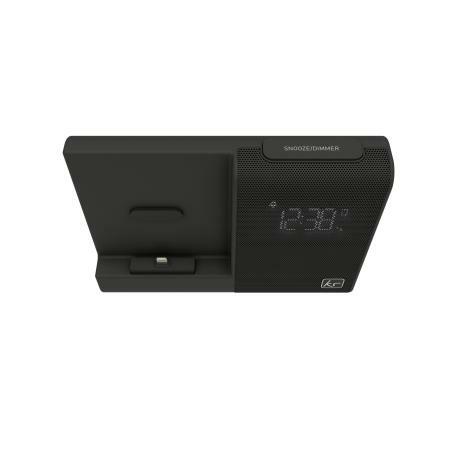 This docking station and clock will wake you up with great sound. Very happy with my purchase. Looks great too. Love the product. Exactly as described. Took only 5 days from UK to Australia. Thank you. 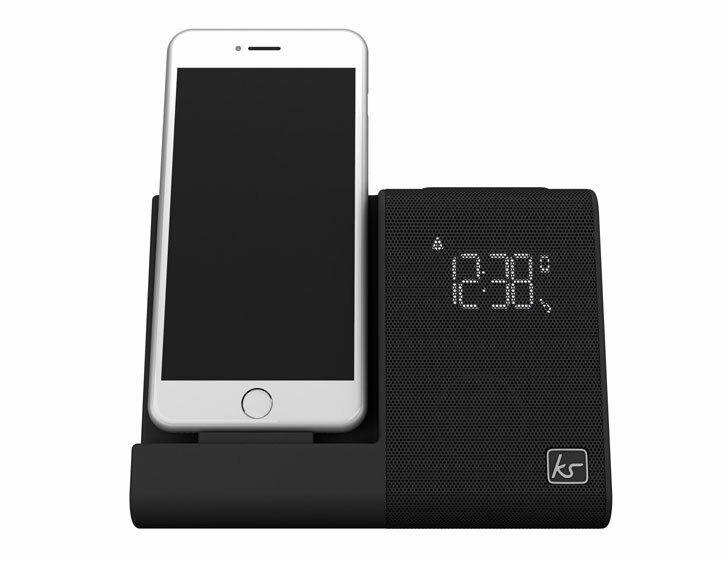 The KitSound X-Dock 4 is designed for devices with a Lightning connection allowing it to work with a wide range of Apple products, including the iPhone 8 Plus, 8, 7 Plus, 7 and any other Lightning-compatible iPhone or iPod. 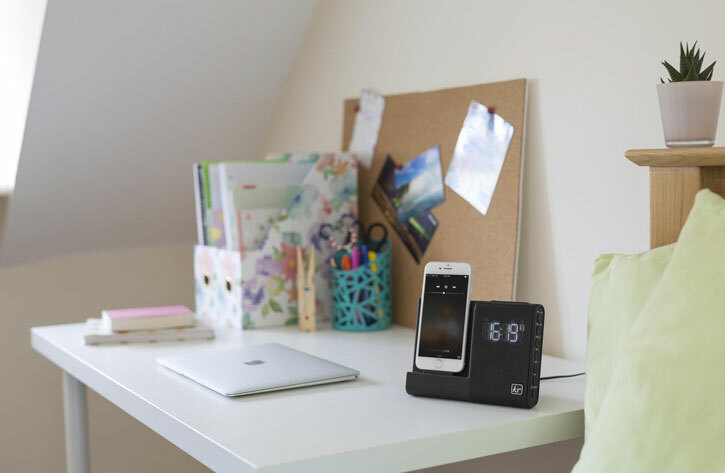 So you can dock, charge and listen to music from your phone through this beautiful alarm clock speaker dock. You'd be forgiven for thinking that radio alarms are a relatively modern invention, but it's believed that ancient Greek philosopher Plato used a large water clock to wake him for early morning lectures. 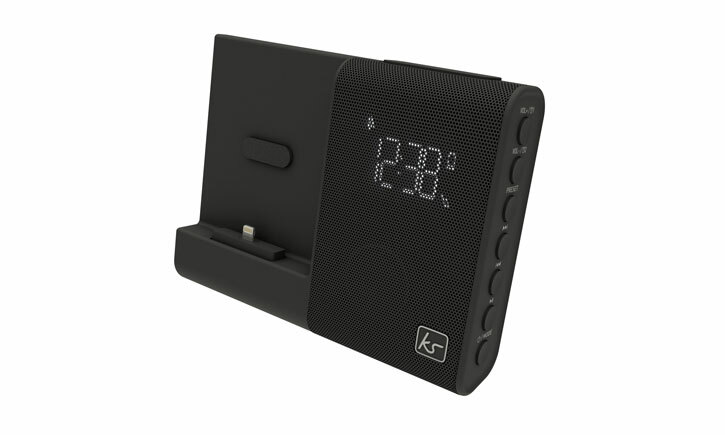 The KS X-Dock 4 is a bit more sophisticated than that, though. It may be small enough to sit comfortably on your bedside table, but this clock dock is surprisingly loud for its size. There is also an LCD display to clearly view the time and an adjustable slider so you can select how bright you wish the screen to appear. There's no need to worry about whether your alarm will be loud enough to wake you. 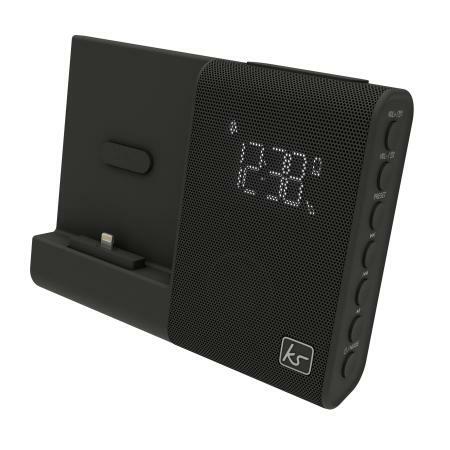 The X-Dock 4 boasts 3 watts of power and is tuned by audiophiles, for music-lovers - so you can use this dock not only as a great clock radio, but as a Lightning speaker in its own right. New to the X-Dock 4 is the ability to choose from up to 3 sources for your audio. Connect an iPhone or iPod while simultaneously taking advantage of the included 3.5mm connector for any audio source, then seamlessly switch to the FM radio to hear your favourite tunes. Once docked the X-Dock 4 will charge your iPhone 8 Plus / 8 / 7 Plus / 7, any compatible Lightning iPhone or even your iPod so that it's ready for the day ahead. It also automatically syncs the time from your device the instant you dock it. Whether you choose to wake to the FM radio, the buzzer, or your favourite iTunes - the X-Dock 4 gives you the flexibility to wake up how you want to. There's also a 'Shhh' button for an extra 9 minutes sleep. Listen to your favourite FM radio stations all from your bedside table, enjoying a variety of musical genres - right at your fingertips. 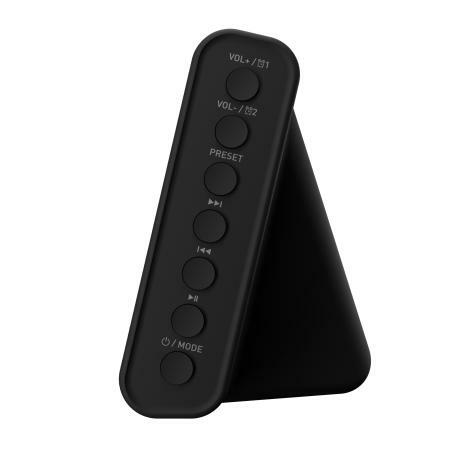 With the built-in Line-in port, you can connect a wide range of audio and video devices so the sound is played clearly using the X-Dock 4. If you have another phone or media player that doesn't support an Apple Lightning connection, this is the ideal way of playing back the music from these devices. iPad users can also use this port for playing back music through the X-Dock 4's speakers. 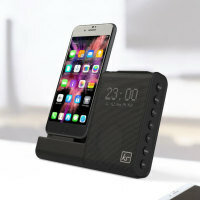 With the 'Made for iPhone' certification, you can be sure of perfect compatibility with your Apple Lightning devices and that the X-Dock has been made with the highest quality materials.